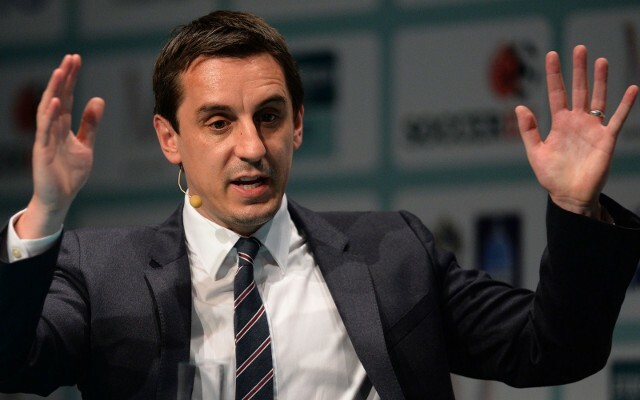 Manchester United legend Gary Neville has reiterated his belief that Arsenal will not win the Barclays Premier League title without significant squad additions. The Sky Sports pundit blasted Gunners boss Arsene Wenger on Monday night for being either “naive or arrogant” for not addressing the issue of signing a replacement for former captain Patrick Vieira in the last 10 years. The Frenchman responded to Neville’s comments in the aftermath of the club’s goalless draw against Liverpool and highlighted Francis Coquelin improvement since breaking into the starting XI at the turn of the year [via Guardian Sport]. However, writing in his weekly column for Telegraph Sport, Neville says the north London outfit will not be crowned champions of England until they add power, pace and strength to their squad. “Precedent suggests it will never happen. To win the league with the front six he played against Liverpool would require history to be redefined,” Neville added.